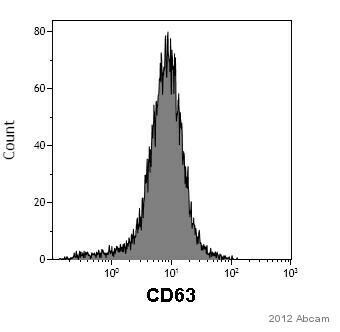 ab77227 reacts with CD63 expressed by granulocytes, platelets, T cells, monocytes/macrophages and endothelial cells. The conjugate is purified by size-exclusion chromatography and adjusted for direct use. Our Abpromise guarantee covers the use of ab77227 in the following tested applications. Use 10 µl/ 100 µl of whole blood or 106 cells in suspension. 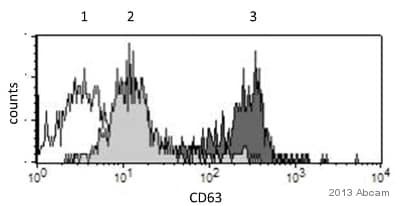 This antigen is associated with early stages of melanoma tumor progression. May play a role in growth regulation. Dysplastic nevi, radial growth phase primary melanomas, hematopoietic cells, tissue macrophages. Cell membrane. Lysosome membrane. Late endosome membrane. Also found in Weibel-Palade bodies of endothelial cells. Located in platelet dense granules.